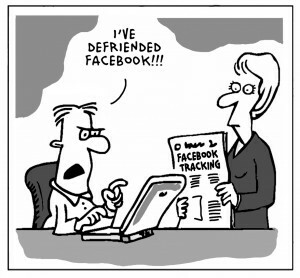 Facebook finally confirmed that it does actually track non-users. The tracking process begins when a user initially visits a facebook.com page. Members get a “session cookie” and a “browser cookie” AND non-members get a “browser cookie”. This means that every time you visit a third-party webpage that maintains a “Like” button or other Facebook plug-in, the plug-in essentially triggers the browser cookie that alerts Facebook of the date you visited the site, the time, the web address of the webpage you clicked on and other unique PC and browser settings including your IP address, screen resolution size, browser version etc… All of this information from a non-Facebook member! This information is ‘stated’ to be kept for 90 days as a continuously running log where oldest days are replaced with the newest activity. Logging onto Facebook (members) is when the session cookie captures additional information. The session cookie records your name, e-mail address, friends and all data associated with your Facebook profile in addition to the above non-member data. Ireland’s Data Protection Commissioner alleges Facebook was creating “shadow profiles” of non-users. Facebook’s technology could potentially be used to build extensive profiles of individual Web users. NOTE – Facebook recently applied for a U.S. patent for technology that includes a method to correlate tracking data with advertisements.